Posters like these were put up in the Japantowns as well as the downtown areas of cities where people of Japanese ancestry lived or shopped. National Archives. The signing of Executive Order 9066, the forced evacuation and imprisonment in the camps, and then the eventual hardship of resettlement, have deeply affected generations of Japanese Americans. These events not only caused huge economic changes to the once tightly knit farming communities, they also caused fragmentation of the families, and profound social change within Japanese American culture. Although the camp experience and the politics that surrounded the imprisonment are now being examined and documented, not much has been done about the resettlement experience—a time that many historians have called the "other half of the internment story." At the conclusion of World War II, thousands of people of Japanese ancestry still remained in the internment camps awaiting their release. However, they were mostly the old and sick or families with young children. The War Relocation Authority had allowed Japanese Americans to go to the Midwest and eastern states to work on the farms and in businesses deemed critical to the war effort. Beginning in 1943, many younger Nisei in their late teens and early twenties had applied to leave and get jobs. The money they sent back to camp often was all that kept their families going during this time. Another large group, able bodied young men between eighteen and thirty-six years of age, had also left the camps—to serve in the US Army in integrated units or the 442nd/100th Infantry and MIS units. So, in early 1945, when the Pacific Coast was reopened to the Japanese Americans, the fragmented community—without their most able-bodied youth—were free to return home. For years, the community had depended on the strength and wisdom of the Issei to guide them. But 1946 found many of the Issei were old, tired, or disheartened and unable to withstand the rigors of rebuilding. It was the Nisei generation, a group made up of the young people who had left camp for jobs, returning veterans, and parents with young families—who now shouldered the responsibility of supporting their Issei parents while raising their own children. Issei father, Yuwakichi Sakauye in his fruit orchard in the 1920's. Eichii Edward Sakauye Collection, California History Center Archives. Nisei son, Eichii Edward Sakauye in the same fruit orchard after the war. National Archives. The Nisei were generally different from their parents, not content to accept their assigned place in society, and always trying to do better so that their children, the Sansei, would have all the advantages that the Nisei themselves had been denied. Some Nisei tried to return to farming strawberries, vegetables, cut flowers, or specialty crops, but the majority soon found that farming was too expensive and labor intensive. A small five, ten or fifteen acre farm could not support a family in the post-war era. In addition, many men had learned a trade in the workshops at camp and significant numbers of veterans took advantage of the Montgomery GI Bill to attend college or trade school. Nisei men, despite the lingering anti-Japanese sentiments and discriminatory hiring practices, eventually either opened their own businesses or found work in the booming home building and manufacturing industries. Others turned to gardening and landscaping — a niche that started also to boom in the post-war economy. From the left: Hiroko Nishiguchi and Larry Oda, share their memories of Monterey in the KTEH documentary, Return to the Valley, KTEH. For the fisherman at the three major fish processing ports in California — San Francisco, Monterey, and Terminal or Fish Island (also known as East Los Angeles) there was virtually no way that they could raise enough capital to return to their former occupation. In 1940, an average trawler with a special net called a "purse seiner" cost about $30,000 to $40,000. Most of the men had lost their boats during the forced evacuation, sold for pennies on the dollar, and they found it impossible to start all over again as common deckhands. Only one family, the Manakas, resumed fishing in the Monterey region. However, over the following decades, as fish stocks plummeted, even they found it unprofitable to continue large-scale fishing. With so many men either incarcerated separately or serving in the military, the women had assumed leadership roles during the internment—accepting the responsibilities of taking care of the families and earning much needed income working in the mess halls, kitchens and laundries. When they returned home, women often were the first to find jobs as domestics and in childcare. They began to earn equal salaries as their husbands and in some cases became the major support of the family. The growing post-war economy also gave women additional opportunities as slowly, secretarial and office jobs began to open up. More and more began to attend college and eventually attaining professional jobs, something unheard of in the Issei generation. These women were not content to stand in the background, quietly pushing their children forward. Instead, they became equal partners with their husbands, with equal say in how the family finances were managed and more importantly, on how the children were raised. Kitako Izumizaki and Helen Nitta Mito discuss the changing role of women in Return to the Valley Return to the Valley, KTEH. The post-War Japanese American community struggled to gain acceptance again—building up their businesses and lives that were so tragically taken away from them during the war years. Their hopes and dreams rested upon the next generation—the Sansei. Little did anyone know that the Sansei would be motivated by dramatic social changes in U.S. society such that they would be a part of and create a movement that would seek to repair the wrongs that their parents and grandparents had been subjected to. The Sansei, with their Nisei parents, worked to recover the past and document the history of Japanese Americans so that future generations would remember the importance of civil rights and liberties even at times of war. This grassroots activism, which started in communities with the Nisei and on the college campuses like UCLA and San Jose State University with the Sansei, eventually led to landmark legislation &#nbsp; the Civil Liberties Act of 1988 (see the chapter on Redress and Reparation.) President Ronald Reagan formally signed the Civil Liberties Act, which gave each Japanese American a $20,000 one time payment and a formal apology from the United States government. For many of the Issei, it came too late. 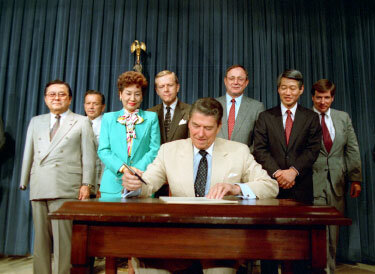 From left to right: Sen. Daniel Inouye (HI), unidentified observer, Rep. Patricia Saiki (HI), Sen. Pete Wilson (CA), President Reagan, Rep. Don Young (AK), Rep. Robert Matsui (CA) and Robert K. Bratt, Justice Dept. Administrator. Ronald Reagan Presidential Library. The forced evacuation and internment of World War II are some of the most documented and studied topics in Japanese American history. However, scholars, researchers, writers and filmmakers are beginning to create new material on other areas of Japanese American history. These topics will continue to generate study and resources in the coming years. Uchida, Yoshiko (1996) Journey Home, Scott Foresman, ASIN: 0663592194. Uchida's book, the sequel to Journey to Topaz, is about returning to their home in Berkeley, California. The family's experiences are told in a manner that children can understand. Daniels, Roger, Taylor, Sandra C. and Kitano, Harry, Arrington, Leonard, editors (1992) Japanese American From Relocation to Redress. University of Washington Press, ISBN: 0295971177. 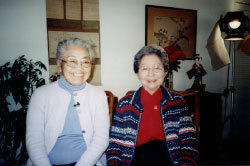 The editors present material of the Japanese American experience from the evacuation order of World War II to the public policy debate over redress and reparations. Tamura, Eileen (1994) Americanization, Acculturation, and Ethnic Identity: The Nisei Generation in Hawaii (The Asian American Experience), University of Illinois Press, ISBN: 0252063589. This book describes the Nisei generation and culture in Hawaii both before and after World War II. Yoo, David (2000) Growing Up Nisei: Race, Generation, and Culture Among Japanese Americans of California, 1924-49 (The Asian American Experience), University of Illinois Press, ISBN: 025206822X. Yoo examines the Nisei generation and how their experiences growing up in the 1920s and 30s ultimately helped them to adjust to camp life. Forward by Roger Daniels.